So, I have been trimming the edges of my Velcro. I started doing this while I was making a bracelet. The untrimmed edges didn't feel good against my skin, because they were sharp and pointy! So... I began to shape the edges into a smooth half circle. I am pleased to participate in the juried exhibition "Wrapped" at Studio 20/17 in Australia. This is my first time to have a show in Australia! Unfortunately, I am not able to attend the show since it is too far away. : ) But if there is anyone around the area, please stop by for me! "6th November – 24th December 2010, Opening Saturday 20th November 2010"
Studio 20/17 is once again hosting our much anticipated Annual Christmas Showcase of contemporary jewellery. This year, over 30 artists will be exhibiting truly unique and memorable work, providing an ideal opportunity for discerning buyers hunting for that special and personal gift. This will be your chance to select something gorgeous and handmade. Two weeks ago, I came by the Didi Suydam Contemporary Gallery to see the exhibition of John Prip: Master Metalsmith and Mentor with Janet Prip, Peter Prip, Robin Quigley, and Didi Suydam. As an RISD alumnus in Jewelry and Metalsmithing, the exhibition was very meaningful to me. It was wonderful to see all the great work in one space. And by the way, the new gallery space was beautiful! More information about the show, please see below. You’ll want to drive down to Newport next week to see the exhibition of work by Danish Metalsmith and founder of the Jewelry + Metalsmithing Department at RISD John Prip (1922-2009). John’s legacy, not only of his work but his influential teaching, is evident in the roster of exhibitors in the show, which features work by his daughter, sculptorJanet Prip ‘74 SC; son, metalsmith Peter Prip; Robin Quigley MFA ‘76 SC, former student of John Prip, teaching at RISD since 1981 and current Professor and Head of the Department of Jewelry + Metalsmithing; and Didi Suydam ‘85 J+M, former student of Robin Quigley. My photos are blurry. Sorry about that. 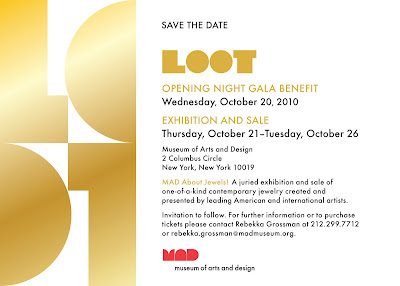 The LOOT exhibition ended last week at the Museum of Arts and Design in NYC. While the exhibition was going on, I had to travel to NYC twice a week. Boy, was that exhausting! So I couldn't update my blog last week, and I am still catching up on work. But I would like to take some time to tell you about LOOT because it was rather successful! First of all, I had a chance to meet so many wonderful artists from the Netherlands, U.S. and Korea! Without this opportunity, where could have I met these fabulous artists? I was so grateful to meet them and to have a show together. Moreover, many interesting people came and talked to me. I was surprised that many people were interested in my work! Also, they really like to meet the artist in person. Some of them became my private collectors. What a wonderful opportunity! All that traveling was well worth the effort!! Some of my favorite pieces are now in the hands of private collectors, and also at the Museum of Arts and Design as part of their permanent collection. I am so thankful for the support! At the same time, I do have to admit that I miss my pieces. My pieces are like my babies, and so I get very attached to them when I get done making them. Unfortunately, I didn't even have a chance to take professional photographs of my new pieces. I feel empty whenever I am at my studio and realize that my pieces are not there. It feels as if a piece of my heart has been cut out. But thanks to your support, I have now been given another opportunity to create more wonderful pieces! This is definitely an encouraging moment. How ironic my life is!! I can't wait to see what life has in store for me next! With my fabulous model and my dear friend, Mary Benyo. I will be teaching a jewelry course called, "New Jewelry: Materials +Techiniques " at RISD|CE. The course is open to all levels. For more information or to register, please visit here. Jewelry can mean many things, but what makes a piece of jewelry unique isn't necessarily the cost. Rather, it's the innovation, creativity and originality of the artist's design. Technique helps to realize a design and this course introduces both new techniques with old materials and old techniques with new materials -- including beads and beading, chain-making, knotting, wire and wrapping, fabrics, leather, found and natural objects, industrial materials such as washers and bolts, and various finishing techniques. Projects include designing and making a variety of styles of necklaces, bracelets and earrings. 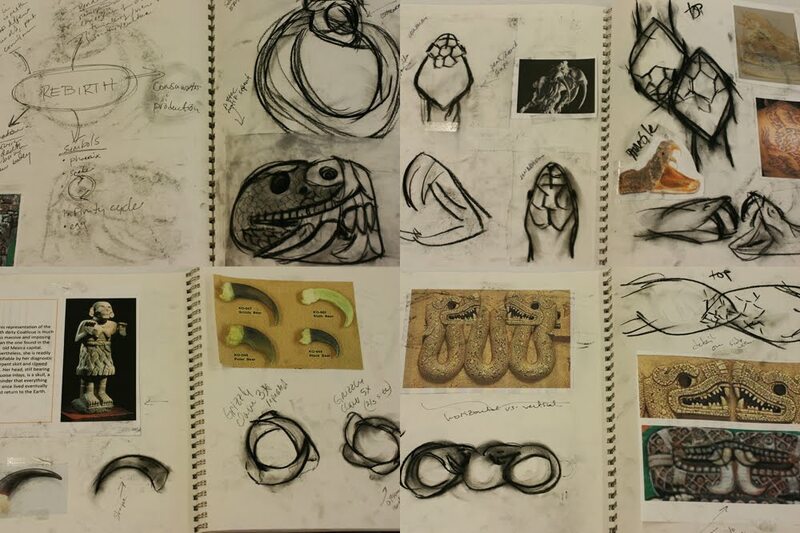 Students are given a historical background on jewelry design as context for their work. As no special facilities are required, all techniques can be practiced at home by students of all levels of experience. Finally, it's time to celebrate! I am going to NYC tomorrow morning to install my pieces at the Museum of Arts and Design. I am a little nervous, since I am not sure how and where I am going to be installing my pieces. But LOOT will be installed on the entire 2nd Floor Gallery and the installation will be overseen by museum exhibition curator and art handlers. So I think I am going to be okay! The LOOT opening gala evening is this Wednesday!! I am so happy to participate in this exhibition. I will upload some photos when I come back. If you are around the area, please stop by the museum! The thoughts of my explorations reminds of my house in Korea. I had been surrounded by many kinds of rocks from my childhoods. This was because of my father. Collecting rocks is my father’s hobby. Collecting rocks can be called as Su Seok in Korean. The meaning of Su Seok is referred for a water-based rock that represent beautiful sceneries of nature specially, mountains, falling water and rivers. My fater was traveling to mountains or valleys in order to discover the beautiful rocks. He wanted to understand the way of nature and the beauty of nature by searching and discoverying unique rocks. For these reasons, my home in Korea was full of rare, unusal, and fasinating rocks. The shapes and forms of the rocks are all differents. After collecting these rocks, my fater stored the rocks with basin and put his efforts and time to shower rocks like shower plants or poslish the rocks. The rocks have been weathered slowly. Well, I am planning to visit Korea in January 2011. I haven't seen my family for two years!! Since I gained a different perspective on the world, I would love to observe my dad's collection again. Let's see what I can learn from it. Following is a part of my next project proposals I am working on. After graduation, I took some time to reflect on my graduate school experience. Returning to school gave me a chance to adopt a holly different perspective on the world, and it has had a profound impact on both my work and my working process. I am now looking for another opportunity to change, and to adopt yet another new perspective. 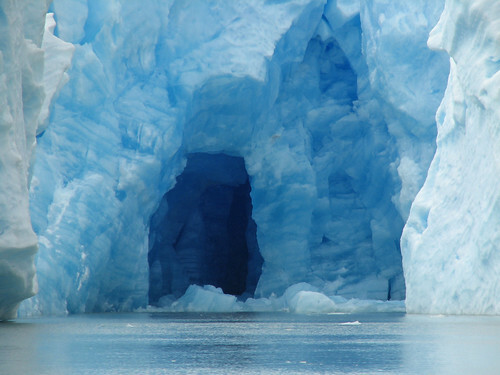 My current working process takes a form similar to the way mankind has explored space, caves, oceans, and new terrains. Instead of thinking about inventing or creating an artifact, I have come to understand creativity as a way to search for, and to discover an insight. Perhaps it is an expansive process no smaller in scale than the evolutionary process that occurs in nature. Ironically, at the end of this expansive process, I am left with a single final product, a piece of jewelry. Unfortunately for those who view my work at a gallery, this explorative process is never revealed or experienced. I have now begun to wonder how I could communicate this process to an audience. Is it possible to make a set of work intended to share my creative journey with an audience? If so, will the audience empathize with my process? Will they find it as valuable an experience as I? 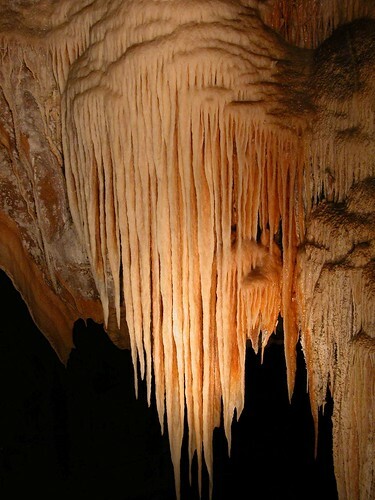 Archaeologists and Explorers have long been involved in the discovery and exploration of caves in nature. 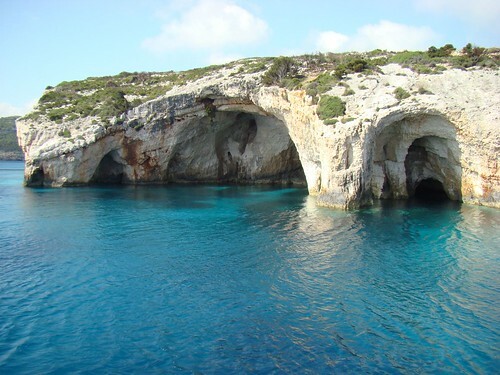 Once discovered and explored, the public also gets to explore these caves to make their own observations on how nature has evolved over time. Like this, as the next step in my practice, I would like to construct an immersive installation that will give the audience a chance to become explorers of my creative process. I have to do researches on history of biology, evolutionary theory, genetics and ecology. There are so many interesting things that I don't know. In September, I just moved to a new studio space! Actually, I am sharing the studio space with Jennaca Davis who is also a RISD alumnus. It's been a great environment to work! Since the studio doesn't have internet access, I feel very productive! Without the internet, I can't imagine how I live in this modern society. However, at the same time, the internet is one of the daily distractions that interrupt my work. When I come back home at night, I can still check my email, social media sites like facebook and RSS feeds. That's one of the reasons that I am a little behind of posting on my blog. Thanks all for being patient! Good bye my summer studio! In August, finally I got my O-1B visa approved. I felt great after I received the actual paper approved-documents. What a relief! I spent so much time, money and energy to prepare the paperwork!! Just so you know, the O visa category covers individuals of extraordinary ability in the sciences, arts, education, business, or athletics. Since I am living in a different country as an international individual, I had to apply for a visa to stay longer in the U.S. So I had to submit all the supporting materials to approve my achievement and ability. After all this effort, I can now stay in the U.S for 3 more years. After 3 years, what happens? Well, I need to extend my visa each additional year. Living in a different country is sooooo hard!! This upcoming fall, I will be teaching a jewelry course called, "Jewelry Fabrication: The Basics " at the Steelyard. The course is open to all levels. For more information or to register, please visit the Steel Yard website. Finally, I had a chance to update the website for my spring 2010 work. Please review the website! http://yongjookim.com If you have any comments on my work, please let me know! I have been invited to participate in LOOT 2010. 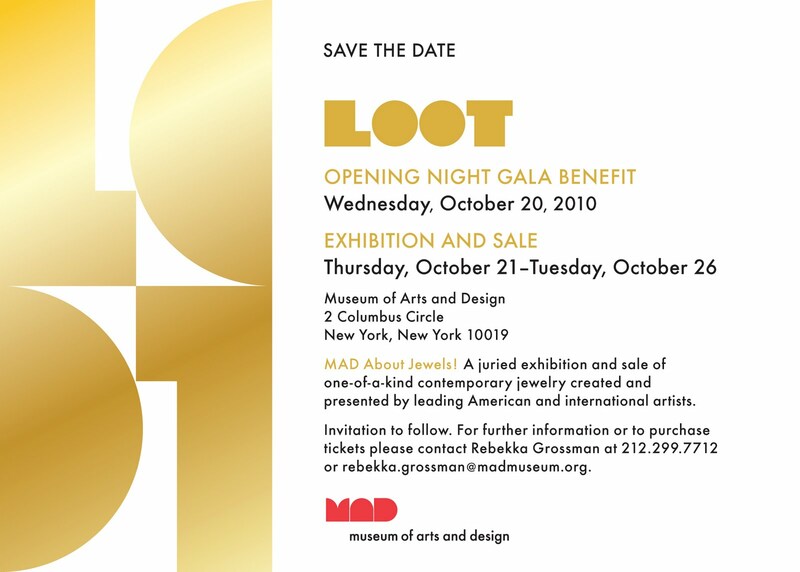 Loot is Museum of Arts and Design (MAD) ’s biennial Juried exhibition and sale of one-of-a kind contemporary art jewelry, created by American and international artists. I am very excited about it. I just received the "Save the Date" card from MAD. This exhibition will be held October 20, 2010 – October 26, 2010, at the Museum (2 Columbus Circle, New York City). The opening night is on October 20, 2010! I am planning to attend the opening night! If you are in NYC, please save the date and visit the exhibition! Fifty eight artists, representing some fifteen different countries, have agreed to participate in LOOT. Over 2,000 pieces will be on view and for sale during the run of the exhibition. A special focus of LOOT 2010 will be the work of fifteen Dutch artists including Beppe Kessler, Iris Nieuwenburg, and Truike Verdegaal. Many participating Dutch artists will be in attendance. Representing a diverse group of established and emerging artists, Dutch jewelers present new forms of jewelry that are independent of traditional concepts of jewelry. While maintaining the country's deserved reputation for outstanding mastery of technique and materials, the artists continue to experiment in creative and spirited designs using innovative materials. Neckpieces, brooches, bracelets, earrings and rings will intrigue and dazzle collectors through imaginative designs that at once acknowledge the past but express the best in contemporary conceptual and technical concerns. Artists from across the US, Europe, and Asia will display and sell their unique pieces during LOOT including Anastasia Azure, Gail Bird and Yazzie Johnson, Pat Flynn, John Iversen, Jocelyn Kolb, Yong Joo Kim, Verma Nequatewa, Joyce Scott, Jennifer Trask, Giorgio Vigna, and Kiwon Wang. Pieces range in price from $300 to $30,000 with an average price of $2,500-$3,000. Traditional materials such as platinum, gold, silver and diamonds and gem stones will be used, as well as experimental ones such as rubber, glass, steel, plastics, lucite, and semi-precious stones, often within a single design. The CE jewelry class at RISD that I taught for the Spring semester is done! It was so much fun and I had great students as you can see my previous postings. Next semester, I will be teaching a different class called, New Jewelry. I am very excited about it! I will keep you updated about the class! These days, my biggest issue is getting the Artist visa (O-1) to stay here longer. All the paper work makes me so busy and overwhelming.. Ugh.. I just want to let you know that I am going to finish all my paper work as fast as I can and I will be back with my new pieces for 2010. In the meantime, Stay cool and enjoy this beautiful summer! 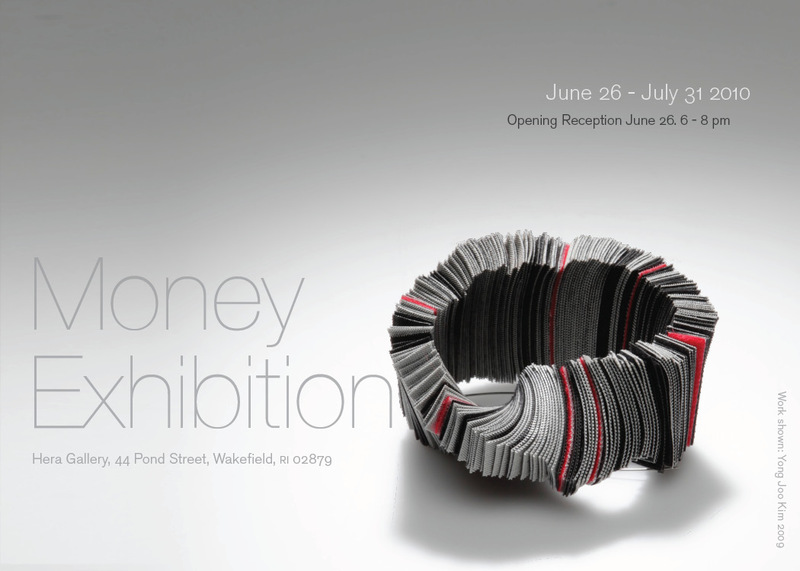 I am pleased to participate in the upcoming juried exhibit "Money" at Hera Gallery in RI. This exhibition will present artwork that reflects upon the influence that money has upon our society, whether it is the artists personal relationship with money, reflections upon current economic status, or money as material, the common denominator will be a critical look at MONEY. The opening will be held on the evening of June 26th from 6:00 – 8:00pm. I am looking forward to attending the opening night! The second assignment was creating a ring inspired by a character. Our students chose a character that they were interested in and extracted the essence of the character. 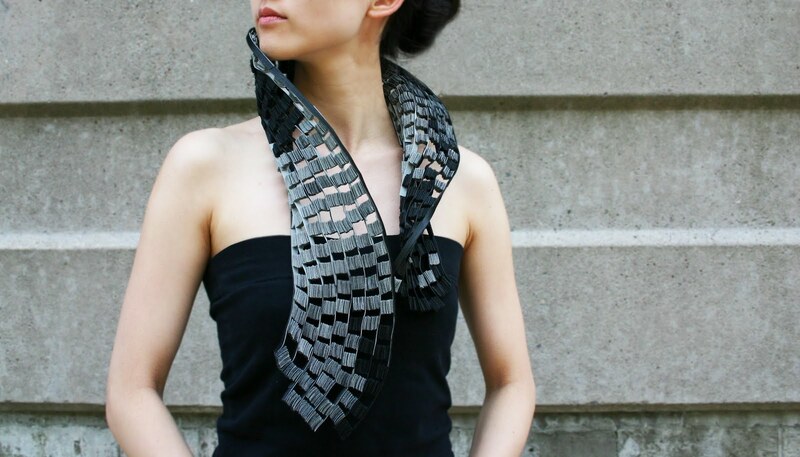 This assignment helped students to explore fabricating a hollow construction from sheet metal, a technique that has endless possibilities in jewelry. The students focused on the basic hand skills of soldering, scoring, piercing, sawing, filing, sanding and bending. Thank you all for finishing this project! Great job everyone! If you'd like to see more images, please click here. It's been almost one year since I graduated from RISD. Finally, I received the RISD Alumni Association membership card!!! Yes!! Now I feel like I become an alumni of RISD. I can't wait to open the box whenever I receive a package. I am satisfied with cutting the package tape and getting rid of the big package box. Here are some images from the catalogue.